This INSIGNIA 0861-00170000000 (NS-A3112) is only one of the many INSIGNIA remote controls we carry. 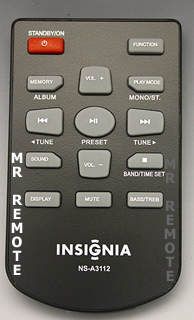 Enjoy the full functionality of on-screen menus and programming that only an original replacement remote can provide. TV-5620-77, 301TT3251030A, NS-RC07A-13, NS-RC05A-13, 301-VTQ2092-19, AKB36157101, 6711R1N213A, 1-3000-A010-0000, TV-5620-87, 0861-00150000000, KK-Y296, NS-RC6NA-14, 301-V22HA37-20A, 076R0MJ020, 06-518W21-BY01X, IS-TV040927, 6010Q03901, NS27RTV, 6711R1P081G, NS-RC9DNA-14, 6011200101, ES06206, 098TRABDENEBYA, 098TRASW4NEBYA, 301-ATS2030-26A, AKB31621906, AKB32782701, NS-39L700A12, 398GR10BEBY00U, 0223-458611-00, 42MJ0101IB, 098GRABD3NEBYU, 1062108, TV-5620-73, 0861-00170000000, RC-263, WIR147002-B301, 6711R1N189C, 076N0DW040-IN, 67100BA1-008-R, ES06360, KK-R012, E28-213880-020, NS-RC4NA-17, RC-V20-0A, ES06249, RC-304, BN59-00892A, RC2441W, NS-RC4NA-14, 098GRABDRNEBYJ, NSRTV32, KK-Y284B-INS, 42MJ3503AG, 33ZY-7102-00, KK-Y271Q, TV-5620-14, 42TB0102B, 42MJ0103D, N0160UD-IN, 076R0KE010, 42ZA3401AG, TV-5620-59, 076N0DW070, 07640KL020, NS-39DR710CA17, 6010V02001, 098TRABDANEBYA, 0861-00160000000, NS-RC03A-13, 07640KL050, WIR248001-B301, NS-RC01G-09, 098GRABDSNEBYU, 6010200101, 90-71V11-002, NS-RC4NA-16, 42TB2803RG, 043-A13232W100, 600-MSS12A-05BX0, 301-ATS2030-23D, ES06236, 098GRABDNNEBYU, 098TRASW5NEBYA, 398GR10BEBYN000, HD3113, 32-27085, NS-RCRUS-17, NS-43DR710CA17, KK-Y283P, 098TRABD1NEBYA, KK-Y295J, MKJ39170826, 086ECR2114, 17-30000780101, 845A45CF13UAINSH, 6710V00151W, 098GRABD6NEBYA, RC-305, TV-5620-46, 076N0DW180, NB095CD, 301-VTQ2092-21A, 6711R1P081W, RC-801-0B.